The Mane Objective: The Mane Objective 10K | 1M Giveaway WINNERS!!! The Mane Objective 10K | 1M Giveaway WINNERS!!! First of all, I just want to say THANK YOU to everyone who entered! The responses were overwhelming. Especially those of you who entered here on the blog -- so much love and so many great ideas! I'll be going through every single comment one-by-one and responding -- if you pitched me an idea with a question that I tackled previously, I'll link it to you. If not, I'll put it on my "to do" list to write about. Please know, that I use www.random.org for each giveaway, unless stipulations are otherwise stated. So for each giveaway this weekend, I put in the max number of entrants per giveaway prize (barring those that entered past the deadline to be fair to everyone), and hand-counted to the number that random.org assigned in chronological order. The first entry is #1, and so on. It's painstaking and takes some time, but I believe in being forthright and fair. 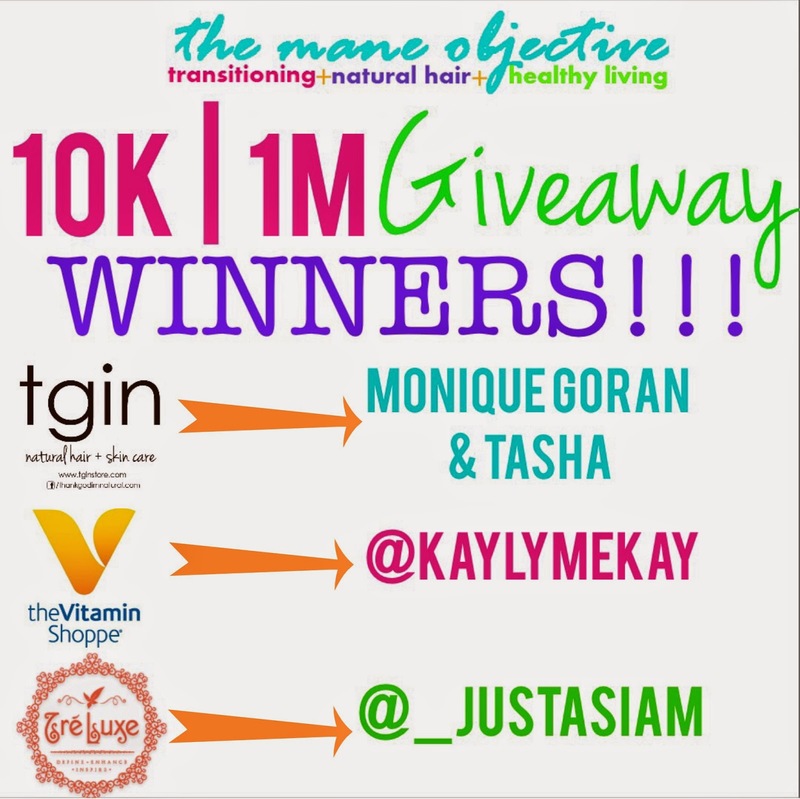 Monique Goran and Tasha -- you've won the TGIN Shampoo & Conditioner duos! @kaylymekay -- you've won the Vitamin Shoppe Ultimate Prize Pack! @_justasiam -- you've won the TreLuxe trio! Please e-mail me at info@maneobjective.com with your shipping information, so I can get your goodies out to you! Thank you ALL again for entering, and don't worry -- there will be PLENTY of opportunities for giveaways and goodies in 2015. The year has just begun! A special thanks to the 10K | 1M sponsors: TGIN, Vitamin Shoppe, and TreLuxe!